The room was very nice and had a great view over the landscape of the hotel! Location, Terrace, 'in the green', Bike facilities. All very well. Also good for handicapped people. Nice room, bed and bathroom. The room condition was OK but not comfortable. Breakfast is super basic. I'd recommend to do breakfast somewhere else. The service in the bar by the waiter with the beard. He was kind, knowledgeble and service minded. Beautiful grounds and surroundings, good breakfast. Fletcher Hotel Landgoed Avegoor This rating is a reflection of how the property compares to the industry standard when it comes to price, facilities and services available. It's based on a self-evaluation by the property. Use this rating to help choose your stay! 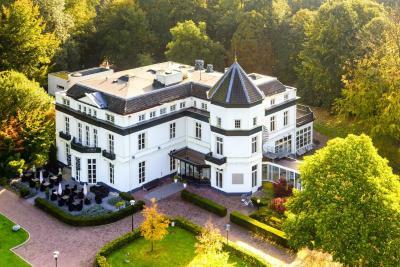 Once a royal residence, this Fletcher Hotel Landgoed Avegoor provides you with tasteful design rooms, an indoor swimming pool and a relaxing sauna. Enjoy the hotel's stylish restaurants and the elegant bar. 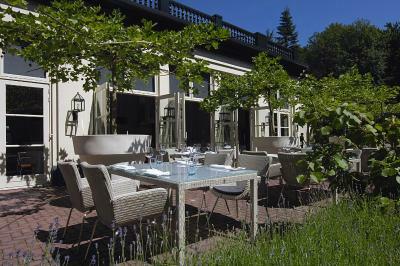 Landgoed Avegoor offers a luxurious base in the heart of the beautiful, forested Veluwe area. The hotel's historical building is surrounded by a large private garden. Weather permitting, you can relax on the outside terrace and admire the environment. Wake up each day with a wholesome breakfast buffet, before going for a shopping trip in Arnhem. You can easily take a hiking or cycling tour through the green area. Visit the National Park the Hoge Veluwe and the Kröller-Müller Museum. At the end of the day, you can go for a swim. The bar and lounge area are a wonderful place to relax and have tea or a glass of wine. Restaurant Avegoor offers international and mediterranean cuisine, using regional and daily fresh produce. This property also has one of the top-rated locations in Ellecom! Guests are happier about it compared to other properties in the area. This property is also rated for the best value in Ellecom! Guests are getting more for their money when compared to other properties in this city. 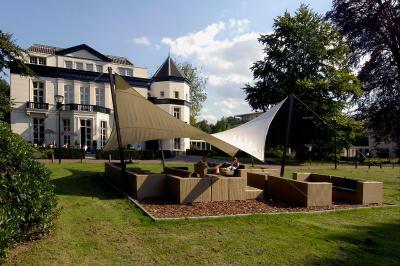 When would you like to stay at Fletcher Hotel Landgoed Avegoor? House Rules Fletcher Hotel Landgoed Avegoor takes special requests – add in the next step! ATM card Debit card Fletcher Hotel Landgoed Avegoor accepts these cards and reserves the right to temporarily hold an amount prior to arrival. Fletcher Hotel Landgoed Avegoor accepts these cards and reserves the right to temporarily hold an amount prior to arrival. Please note that an iron/ironing facilities and bathrobe are available upon request from the reception. The building is nice and the restaurant/bar as well. Hovwever I asked to change the room they gave me, as it was smelling to cigarrette smoke and the one I got had humidity smell. Rooms and in general the newer area building is bit decadent, needs to be renewed and room was not as clean as expected, Not for a 4 star. Heating system was uncomfortable and uncontrollable by customer and when adjusted at (external) central point at customer request, was either far too hot (26 deg) or too cold (17 deg). Breakfast. I expected more for the price, but it was super basic. The restaurant was under expectations without english catalogues and expensive for the offered quality and service. My room was really dirty. Almost two weeks and nobody use Hoover there... Breakfast was really expensive without any special reason... really poor. I had a room above the party hall and was not able to relocate! The staf is not welcomming and the quality of our 4 rooms, bathrooms and breakfast and meals was way below 4 stars usual. Lots of visible maintenance and staf sometimes even rude. Everything is 'Dutch cheap' and I am Dutch myself, meaning just enough quality not to run away but for sure no value for money. The hotel is in a nice building but no old element was allowed to stay. Not a good atmosphere. carpets, walls were very dirty and old. In the restaurant, the people who are serving are taking too long to hand over the menu and ask for a drink. After asking if we could get something to drink we got their attention and finally took our order. Besides all of that the food was very good and delicious! Very loud guests at 1AM. Staff could be friendlier.